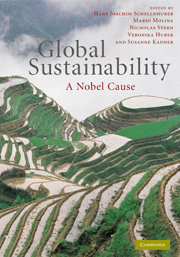 Arising from the 1st Interdisciplinary Nobel Laureate Symposium on Global Sustainability in Potsdam, this book brings together Nobel Laureates in Physics, Chemistry, Medicine, Economics and Peace - top-level representatives from politics and NGOs, and renowned experts on sustainability. In an unparalleled attempt to address humankind's transformation to global sustainability, the authors explore the best scientific and political strategies for reconciling our civilization with its physical and ecological support systems. The book features a radically interdisciplinary approach through a broad range of contributions, covering the latest insights from climate impact research, environmental economics, energy resource analysis, ecosystems science, and other crucial fields. It is for everyone interested in sustainability issues. Intellectually stimulating articles address the complex challenges arising from the need to avoid dangerous climate change, covering both advanced mainstream concepts and novel transformational approaches. Foreword Angela Merkel; Preface Hans Joachim Schellnhuber, Mario Molina, Nicholas Stern, Veronika Huber and Susanne Kadner; Prologue: save the boot room Ian McEwan; Part I. The Great Transformation: 1. Transformations of the twenty-first century: transitions to greater sustainability Murray Gell-Mann; 2. Commentary: integrated sustainability and the underlying threat of urbanization Geoffrey B. West; 3. Commentary: earth system analysis and taking a crude look at the whole Wolfgang Lucht; 4. Making progress within and beyond borders Johan Rockström, Katrin Vohland, Wolfgang Lucht, Hermann Lotze-Campen, Ernst Ulrich von Weizsäcker and Tariq Banuri; 5. Towards a sustainable future James P. Leape and Sarah Humphrey; Part II. Climate Stabilization and Sustainable Development: 6. Scientific understanding of climate change and associated risks – consequences for a global deal Stefan Rahmstorf, Jennifer Morgan, Anders Levermann and Karsten Sach; 7. Towards a global deal on climate change Nicholas Stern and Su-Lin Garbett-Shiels; 8. Commentary: the German contribution to a global deal Sigmar Gabriel; 9. A 'just' climate agreement: the framework for an effective global deal Sunita Narain; 10. Commentary: carbon justice and forestation – the African perspective Wangari Maathai; 11. Carbon offsets, the CDM and sustainable development Diana Liverman; 12. Insights into the climate challenge Rajendra Pachauri; 13. Commentary: climate change – learning from the stratospheric ozone challenge Mario Molina; 14. Climate change, poverty eradication and sustainable development Nitin Desai; 15. Commentary: development and sustainability: conflicts and congruence Kirit Parikh; Part III. Institutional and Economic Incentives: 16. Robust options for decarbonization Thomas Bruckner, Ottmar Edenhofer, Hermann Held, Markus Haller, Michael Lüken, Nico Bauer and Nebojsa Nakicenovic; 17. Price and quantity regulation for reducing greenhouse gas emissions Ottmar Edenhofer, Robert Pietzcker, Matthias Kalkuhl and Elmar Kriegler; 18. Commentary: controlling climate change economically James Mirrlees; 19. What is the top priority on climate change? Paul Klemperer; 20. Research and technology for sustainability – a global cause Annette Schavan; 21. Commentary: energy research and technology for a transition toward a more sustainable future Nebojsa Nakicenovic; Part IV. Technological Innovation and Energy Security: 22. A world powered predominantly by solar and wind energy Walter Kohn; 23. Low cost 'plastic' solar cells: a dream becoming a reality Alan Heeger; 24. Smart grids, smart loads and energy storage Joachim Luther; 25. The SuperSmart Grid – paving the way for a completely renewable power system Antonella Battaglini, Johan Lilliestam and Gerhard Knies; 26. Getting the carbon out of transportation fuels Felix Creutzig and Daniel Kammen; 27. Opportunities for technological transformations and the dawn of a CO2-negative industry: from climate change to climate management? Maria Magdalena Titirici, Dieter Murach and Markus Antonietti; Part V. A Global Contract between Science and Society: 28. Promoting science, technology and innovation for sustainability in Africa Mohamed Hassan; 29. Information flow: the basis for sustainable participation John Sulston; 30. Commentary: educating and motivating global society Susanne Kadner; 31. Commentary: democracy and participation Achim Steiner; Part VI. The Potsdam Memorandum: 32. Potsdam Memorandum; 33. Commentary: the Potsdam Memorandum: a remarkable outcome of a most important conference Klaus Töpfer; Appendix: glossary; Co-authors' biographies.